Article from Hill Times today on the occasion of my book launch. Open event, The 3 Brewers, Bank and Sparks, today between 5 and 7 pm. Look forward to seeing many Ottawa-based people there. Best price for paper version of book ($15, HST and shipping included). Andrew Griffith offers an insider’s account about the major cultural shift in the public service when the Conservatives formed government back in 2006. When the Conservatives won government in 2006, the federal public service was not prepared for the ideological change to public policy-making, says a former top mandarin and author of the new book Policy Arrogance or Innocent Bias: Resetting Citizenship and Multiculturalism. 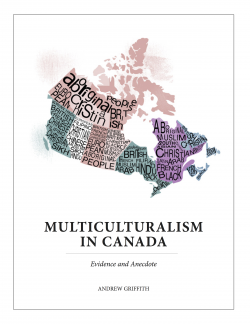 Mr. Griffith, a former director general at the Canadian Heritage Department who worked on multiculturalism policy, is launching his new book in Ottawa on Sept. 23 at The Three Brewers, 240 Sparks St., from 5 to 7 p.m. He moved over to the Citizenship and Immigration department when Jason Kenney (Calgary Southeast, Alta.) was named the minister in 2008 and took the multiculturalism files with him. Using his experience with implementing multiculturalism and citizenship policy, Mr. Griffith wrote an insider’s account about the major cultural shift in the public service when the Conservatives formed government. Mr. Griffith said the differing worldviews “sharpened tensions” between the public service and the new government. In the case of multiculturalism and citizenship policy, he said, the Conservative government’s worldview was a complete departure from that of former prime ministers Pierre Trudeau, Brian Mulroney, and Jean Chrétien. “They didn’t like much of the traditional approach in multiculturalism and everything like that, sort of the old-style focusing on visible minority issues. On citizenship, it was very clear they wanted a stronger reference to Canadian history, military, Crown, etc., and so the way they would come at the issues is we’d have a meeting, and they’d say, ‘Here’s what we want,’ and we’d initially figure it out. In many cases, it appeared very foreign to us in terms of what we knew about Canada, so it took us time to absorb it and react to it and find a way to say, ‘Now we understand it so we can actually work with you,’ ” he said. Mr. Griffith said several of the policies generated were based on anecdotes that the minister or his staff would bring back and attempt to fix. For example, in Policy Arrogance, he outlined that in the case of making changes to citizenship rules around “birth tourism”—or dealing with people who planned trips to Canada so that their baby would be born on Canadian soil and be granted automatic citizenship—anecdotes “trumped” evidence he said, because there was very little data to begin with. Mr. Griffith wrote that the CIC later engaged with medical associations and hospitals to “ascertain the extent of the issue,” but did not consult with provincial health systems that would have allowed them to see how many births were paid or not paid through the public system for which citizens and permanent residents are eligible. Mr. Griffith told The Hill Times that public servants couldn’t discount Mr. Kenney’s anecdotes, however, because he went to at least 20 community events three weekends out of four. “His anecdotes had a reasonable amount of weight,” he said, noting that officials did not take the anecdotes wholly; as the people Mr. Kenney was seeing was not entirely representative of the Canadian population. When it came time to rewrite the citizenship guide, Discover Canada, the public servants working on it “didn’t get it right at all,” so the ministerial and political staff “actually wrote it for us” and the department went from there, Mr. Griffith said. Writing that experience down “was actually satisfying and cathartic,” he said. “My intent was actually to provoke a bit of a discussion initially within the public service about the relationship issue between the government and the public service because my sense was that we didn’t manage the relationship very well at the beginning,” Mr. Griffith said about writing the book. There was a difficult line between the public servants giving “fearless advice” and putting into practice the “loyal implementation” role, he said. While he couldn’t say whether this was widespread in other departments, Mr. Griffith said politicians are likely more drawn to anecdotes than scientific evidence and statistics because they are people’s people. “This government is more ideological than previous governments. This government does tend to discount evidence. This government does actually tend to cut things that do provide evidence, like the census. All that’s on the public record,” Mr. Griffith said. “How it works in individual departments, I’m not close enough to know that. I do know from some people that yes, some ministers are more receptive to listening to advice but again that always gets run by ‘The Centre’ [the PMO]. In the end, whether the minister listens or not is almost less important than whether ‘The Centre,’ i.e. the PMO, listens to it,” Mr. Griffith said. Former CIC mandarin says several public policies came from minister’s anecdotes | hilltimes.com.